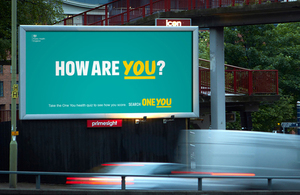 PHE’s One You campaign is helping middle age people live more healthily by asking ‘How are you?’ and providing free support and tools. Eight out of 10 of the middle aged either weigh too much, drink too much or don’t exercise enough, as new analysis from Public Health England (PHE) out today (28 December 2016) shows modern life taking its toll on health. PHE’s One You campaign is reaching out to the 83% of 40 to 60 year olds (87% of men and 79% of women) who are either overweight or obese, exceed the Chief Medical Officer’s (CMO) alcohol guidelines or are physically inactive, to provide free support and tools to help them live more healthily in 2017 and beyond. Modern life is harming the health of the nation: 77% of men and 63% of women in middle age are overweight or obese. Obesity in adults has shot up 16% in the last 20 years. Many also can’t identify what a ‘healthy’ body looks like, suggesting obesity has become the new normal. The diabetes rate among this age group also doubled in this period in England. Obese adults are more than 5 times more likely to develop Type 2 diabetes than those who are a healthy weight (a body mass index between 18.5 and 25). Ninety per cent of adults with diabetes have Type 24. People are being urged to take a moment to consider their health and the simple steps they can take to improve it in the run up to the New Year, by taking the One You online quiz. People need to eat better, be more active, stop smoking and consider their drinking. More than 1.1 million people have taken the quiz so far and where appropriate, been directed to download our apps like Couch to 5K, Alcohol Checker and Easy Meals. Nearly a quarter of a million people have subsequently downloaded Couch to 5K. These sit alongside PHE’s other online tools like the Heart Age tool which gives you your ‘heart age’ based on you age and lifestyle and we would also encourage people to take up their NHS Health Check invitation when they receive it. People are busy with work, with families, with the daily grind and sometimes their own health is the least of their priorities. The How Are You Quiz will help anyone who wants to take a few minutes to take stock and find out quickly where they can take a little action to make a big difference to their health. The demands of modern day living are taking their toll on the health of the nation, and it’s those in middle age that are suffering the consequences most, as their health reaches worrying new levels. Over 15 million Britons are living with a long term health condition , and busy lives and desk jobs make it difficult to live healthily. But just making a few small changes will have significant benefits to people’s health now and in later life. We know that people often bury their heads in the sand when it comes to their general health but the consequences of doing nothing can be catastrophic. There are an estimated 11.9 million people at increased risk of developing Type 2 diabetes in the UK because of their lifestyle and more than one million who already have the condition but have not yet been diagnosed. Type 2 diabetes can lead to serious complications such as amputation, blindness, heart attack, stroke and kidney disease. We know how hard it is to change the habits of a lifetime but we want people to seek the help they need to lose weight, stop smoking and take more exercise. Lots of us spend our lives working very hard, not sleeping enough and not always having time to exercise, so it can be really difficult to prioritise our health. But it’s vital to find out how you really are, so that you can get the advice and support you need. It’s never too late to improve your health and making small changes now can have a huge impact on your health in the future: it can even help to reverse preventable diseases. With the new year just around the corner, there’s no better time to start living better and enjoy the health benefits that will bring. Search ‘One You’ online to take the ‘How Are You’ quiz. Download content including images and a short animated film. Access the Heart Age tool. Find out more information on NHS Health Checks.